In an absolutely stunning development President Obama has now decided that he will go to congress to seek authorization for strikes against Syria. Now to be fair I have to say up front that I have been riding the fence about whether or not we should strike Syria, not because the crime doesn’t fit the punishment but because what the president is proposing wont accomplish anything but to say that he kept his word. Also lets not lie, America isn’t exactly very strong right now. Borrowing 40 cents of EVERY dollar spent by the federal government, mostly from those thugs in China, should make all of us hesitate at least a little before starting another middle eastern adventure. Having said that the fact that Obama has now gone to congress to seek political cover (something no president has ever done for a limited military action in the modern era, not even Carter was that weak) after trying to talk tough against Syria has made America look pathetically weak to exactly those people who need to fear us. America has not looked this weak and vulnerable since the failed bid to rescue the hostages in Iran. Furthermore the president’s about face has had just the opposite effect of what the strike was supposed to have done, it has now emboldened ALL of our enemies in the region. To say that this is amateur hour in the White House is an extreme understatement. Our country now desperately needs someone with a new vision and decisive leadership to fix our many problems at home and abroad because it sure isn’t going to come from this White House. God have mercy on this nation because we have incompetents in charge of us now. F-16’s are just one of the many advanced weapon systems that American tax payers have provided to Egypt. Egypt, what can you say about it as you watch what is happening over there? As we all watch Morsi grab for more power acting very much like the dictator he replaced, with talk of bringing Sharia Law to Egypt, the obvious conclusion here is that everything the US has tried to build on since the Camp David Accords is literally crumbling before our eyes. The peace that the Carter administration (one of the few positives for them) brokered between Egypt and Israel, literally bought and paid for with your tax dollars to the tune of roughly about $2 billion a year for a little over 30 years looks to be in serious jeopardy. Worse still comes the realization that much of that $2 billion every year has been spent arming Egypt with advanced US weaponry. From Apache attack helicopters to M-1 tanks Egypt is now armed with some of the best weapons your tax dollars could buy. So if this disaster in the making in Egypt maintains present course and leads to an Egypt less free, at odds with Israel, and armed with some of the best US weapons in the American arsenal can any sane individual not think of this as the total collapse of American foreign policy in the mid east? Mohamed Morsi, former member of the Muslim Brotherhood, won the Egyptian Presidency in a runoff election. 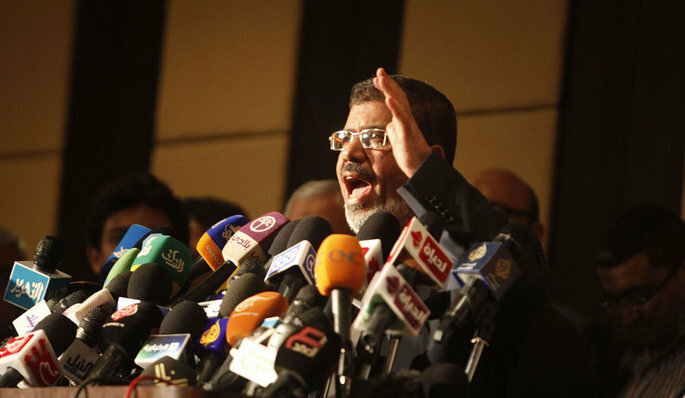 During a recent speech Morsi said that his administration would honor all international treaties. Many observers have said that this was a signal to the west that he will abide by the Camp David Accord (US brokered treaty between Egypt and Israel). For now Morsi remains somewhat of a wildcard although the Eyptian military will keep a check on his power. Also Egypt receives large amounts of US aid as part of the Camp David agreements so he could not go to far off the reservation without jeapordising that. Sick Uncle Sam is about America and the problems facing it.